A B.C. teen says his rights were violated when he was set upon by security guards and arrested by police after taking photographs at Metrotown shopping mall in Burnaby, B.C. A B.C. teen who aspires to be a journalist says his rights were violated when he was set upon by security guards and then arrested by police after photographing an incident at Metrotown shopping mall in Burnaby, B.C. Jakub Markiewicz ,16, said he was in the mall in September and took a picture of what he thought was a newsworthy event — a man being arrested by security guards. But Markiewicz said the guards quickly turned on him, demanding he delete the photo, which he couldn’t do because he was shooting on a film camera. Markiewicz said he turned to leave the mall and then snapped a second shot as RCMP arrived. 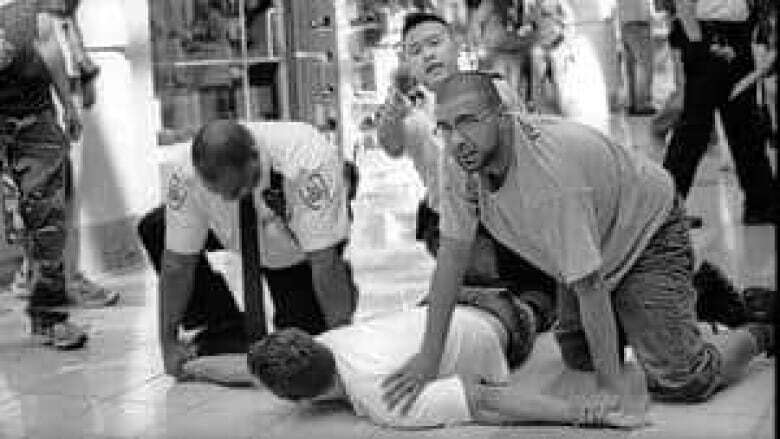 He said the security guards held him, attempting to grab his camera, and he was pushed to the ground. He said he then tried to use his body to protect two cameras he carried in his bag. "They're just yelling and screaming, and just telling me to stop resisting," Markiewicz said. He admits he started swearing and was then handcuffed by police and taken outside the mall to an RCMP cruiser by the officers and mall security. Markiewicz said the guards again demanded he delete the photos and he told them once more he couldn’t. He said the Mounties could not remove his backpack while he was handcuffed so they cut it off his back with a utility knife and searched it. "I was like, just perplexed. I was like, ‘What's going on here, why am I being treated like this?’"
Burnaby RCMP say Markiewicz was arrested for causing a disturbance, but was not charged. He has, however, been banned from Metrotown mall for six months. The teen’s father, Zbigniew Markiewicz, said mall security and police completely over-reacted. "There’s no real threat to anyone by having a camera and snapping a picture," he said. Lawyer Douglas King, of Pivot Legal in Vancouver, agrees, saying that private mall security guards and police have no right to try to seize someone’s camera or demand that photos be deleted — even on private property. King said that too often, police take the side of guards, with no questions asked. "They need to be able to look at this with a cool head, separate the parties, and really give a fair analysis to both sides, not put a kid in handcuffs and take him to a police cruiser," King said. Metrotown mall backs the actions of its security guards. "He didn't comply with the request of the security nor the RCMP, so they took appropriate action they deemed necessary to defuse the situation," said Doug MacDougall, of Metrotown Properties. MacDougall said that Markiewicz was told that he couldn't take pictures inside the mall. King said the province needs better oversight of security guards. Justice Minister Shirley Bond told CBC News that current legislation contains adequate measures to ensure appropriate oversight of the security guard industry, but said that oversight is a big job. "Remember, there are 22,000 licensed security personnel that are doing their job every day — there are situations that will happen, but we have a process to deal with that, as do the police," Bond said in an email. Justice ministry spokeswoman Tasha Schollen said there had been 371 complaints related to the security industry filed since the beginning of 2011. Schollen said 22 of the complaints related to use of force and of those, five have led to "enforcement action."